Jio DTH welcome offer, free service for 90 days. Jio DTH channel pack will include 300 sd TV channels and 50 HD TV channels. According to reports, customers can expect a welcome offer for Jio DTH services. The reports also add that the DTH service of Jio will be free for 90 days. The JIO DTH decoder (Set top Box) is ready, and the company is ready to begin DTH or IPTV service in April. Reports show that Jio DTH services will have an Android TV box or Apple configuration box that can be used to transfer any TV channel to your TV with plans as cheap as Rs 180 per month. Jio DTH will also have a LAN port to use Jio high-speed broadband, which gives a transfer rate to 1 Gbps. According to the reports, the TV channel pack of JIO direct to home TV service will have more than 300 TV channels and also more than 50 HD channels. A series of leaks and unconfirmed reports suggest that Reliance Jio could quickly enter the transmission segment with its own set of DTH and IPTV services. A leaked report from Jio says that Jio's DTH / IPTV service with have over 350 channels and hardware features such as voice control and a software function could start allowing users to watch TV programs of the last 7 days. When contacted by MediaNama, a Jio spokesman declined to confirm or refuse such plans. 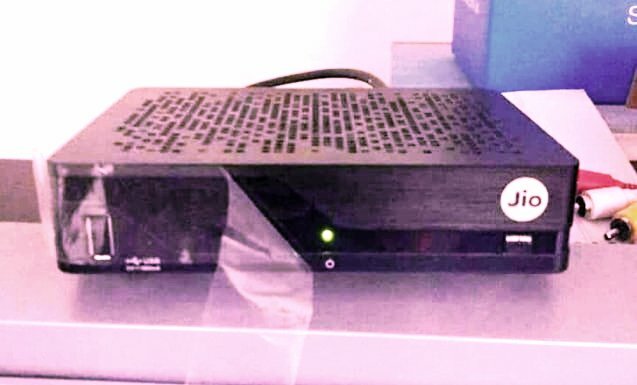 The leaked images show that the decoder (Set top Box) has an HDMI port for HDTV output, an RJ45 port for Internet connectivity (IPTV), and a USB port on the back and the premiere, possibly for multimedia streaming with flash drives. The box also has a coaxial outlet and a cable input for TV signals to receive via a cable or Dish antenna connection.